Clayton Kershaw is having an unbelievable season ... even by his standards. It’s nearly the middle of September and Clayton Kershaw has a ridiculous 1.92 ERA. We’ve seen starters put up sub-2.00 ERAs in the last couple of decades -- Roger Clemens, Pedro Martinez and Greg Maddux each did it twice -- but the last lefty starter to finish a season with an ERA under 2.00 was John Tudor of the St. Louis Cardinals in 1985 (1.93). Lefties face a much harder task in attempting to post consistently low ERAs compared to righties. They simply face more batters coming from the opposite side due to the number of right-handed hitters compared to left-handed hitters in the big leagues, making Kershaw’s accomplishments the last several years even more impressive. This season, Kershaw has faced 834 hitters, and 669 of them have been right-handed (80 percent). By comparison, when Clemens had a 1.87 ERA in 2005 for the Houston Astros, he faced 838 hitters, and 399 were left-handed (48 percent). In addition to leading the majors in ERA, Kershaw is third in MLB in opponent’s batting average at .194, trailing only Miami Marlins rookie Jose Fernandez (.182) and Yu Darvish (.191). Despite throwing it only 12 percent of the time, more than a third of Kershaw’s 208 strikeouts this season have come on curveballs (71). That’s because he saves it almost exclusively to finish off hitters. Of the 381 curveballs he’s thrown this season, 279 have come in two-strike counts (73 percent). 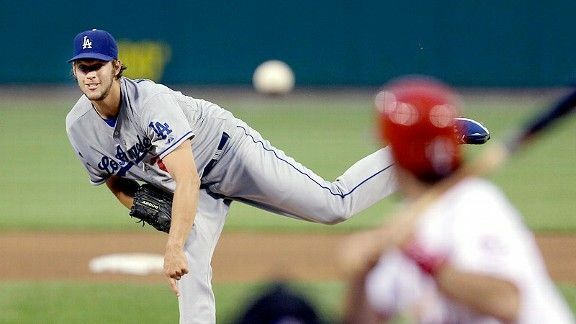 Today, Kershaw takes on the San Francisco Giants for the fifth time this season. In the previous four starts, the Los Angeles Dodgers ace is 3-0 with a 1.13 ERA, allowing just 14 hits over 32 innings. This dominance over his rivals to the north is nothing new. In his career, Kershaw has more wins (11) and a lower ERA (1.32) against the Giants than he does against any other team he has made at least three starts against. Barring several rough outings down the stretch, Kershaw will become the 25th lefty to win the ERA title in the division era (since 1969), having already done it twice himself in 2011 and 2012. The last National League pitcher to take home three straight ERA titles was Maddux, from 1993 to 1995. And the last lefty to do it was a man who comes up often when Kershaw is discussed -- Sandy Koufax. The Hall of Famer won the ERA title five straight years from 1962 to 1966.